Mr. Demolli' defines his work as “nostalgic” paintings as they conjure up distant landscapes or moments in time. Perhaps most significant, however, is Jesse's adaptation of our own American landscape into murals. By this token Jesse brings the tradition of renaissance art from Florence to the United States and presents it to a public forum as the “purest form of expression,” a mural." Mr. Demolli was 8 years old when he knew that one day he would become an artist. 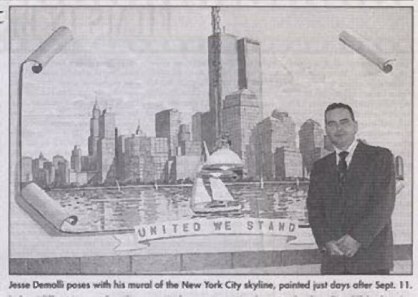 He painted his first public mural at age 13. Since then he has painted for museums, government buildings like the Town Hall in St. Michaels MD, businesses and private homes. ST.MICHAELS - Jesse G. Demolli was just trying to cross the street, but before he had made it from Carpenter Street to Yesteryear's, he had been offered a job. Then another one. Then a third. It's not surprising, then, that Demolli, calls St. Michaels "the town of the dream." So far Demolli has painted murals for businesses and homes all over St. Michaels, as well as a few in Easton and Royal Oak. His murals adorn the walls of Yesteryear's, the St. Michaels Police Department, both Rusticana restaurants and the Scented Garden.A resident of St. Michaels for barely two months, he had a dozen jobs lined up at press time. But given the demand for his work, that number has probably gone up. "By the time I'm finished," Demolli said, "I'll have painted St. Michaels." EASTON - Painter Jesse Demolli views America through the eyes of an immigrant. The 38-year-old painter moved from Florence Italy to Silver Spring in 1995, and to St. Michaels in March of this year. 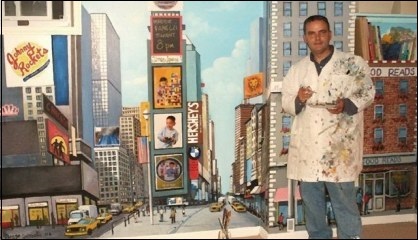 "I've traveled a lot and I've seen a lot of great countries," says Demolli, whose specialty is murals. "And I find out that America is one of the greatest countries in the world." As his flight from Italy approached John F. Kennedy Airport, he recalls, Manhattan appeared [through the clouds] like a dream. But the dream turned into a nightmare on Sept. 11, when terrorists dive-bombed the World Trade Center and the Pentagon in hijacked aircraft. 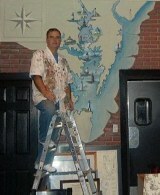 Jesse Demolli's Pinelands Mural Graces Walls of Tuckerton Seaport Museum.